The CTD2 Dashboard is a portal to browse and search positive results from the Network. 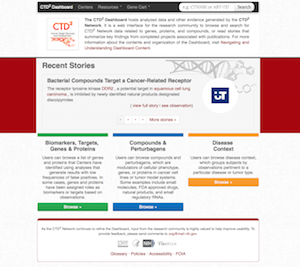 The CTD2 Dashboard hosts analyzed data and other evidence generated by the CTD2 Network. It is a web interface for the research community to browse and search CTD2 Network data related to genes, proteins, and compounds from individual CTD2 Centers, or explore observations across multiple Centers. Users can also read stories that highlight completed projects associated with publications. To learn more, visit the CTD2 Dashboard.